If this doesn’t look like any 4-Way HDMI Splitter you’ve ever seen, it’s because it’s not! 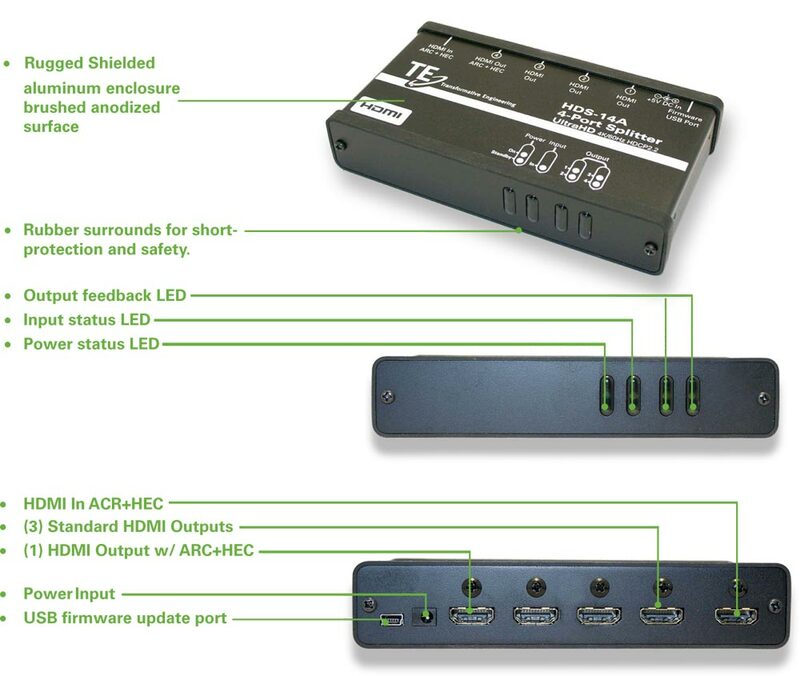 Our 4-Way HDMI Conditioning Splitter is designed to Stabilize and correct HDMI signals that may have been compromised by non-conforming HDMI devices. Many HDMI products may not present a signal with correct EDID, “handshake”, or HDCP protocols. As a result, you may experience intermittent or unsatisfactory display. We recognize that and solve most of these issues by establishing a proper “handshake” at the input to this device (with your source) so that your display will operate reliably. This “splitter” supports ARC (Audio Return Path) and HEC (Home Ethernet Connection) through Output #4. All outputs support 3D, 2K x 4K, Deep Color, xV Color, High Speed transmissions, HDMI2.0, 4K/60Hz/4:4:4, HDR, and HDCP2.2. Also supported are all current HDMI Audio Formats including: Atmos, Dolby TrueHD, and DTS Master Audio. It is powered by an included 5V Power Supply. In addition, we provide a USB port for future firmware updates. There are no buttons, dials, or switches to set or re-set. 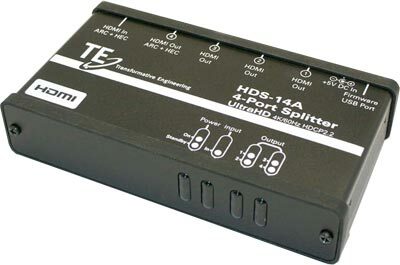 The HDS-14A will detect the EDID of each of the 4 connected displays when it is powered up and the best image package that can be reproduced by all of the displays. This sets you up with a clean, efficient 4-Display System while assuring the HDCP signals are correctly handled – giving you reliable, consistent HDMI connections at start-up and all day long.